Anderson, Jack, and Ronald W. May. McCarthy: The Man, the Senator, the ism. Boston: Beacon Press, 1952. Bayley, Edwin R. Joe McCarthy and the Press. Madison: University of Wisconsin Press, 1981. Buckley, William F., and L. Brent Bozell. McCarthy and His Enemies: The Record and Its Meaning. 1954. Reprint. New Rochelle, NY: Arlington House, 1970. Belfrage, Cedric. The American Inquisition, 1945-1960: A Profile of the McCarthy Era. 1973. Reprint. New York: Thunders Mouth Press, 1989. Cohn, Roy M. McCarthy. New York: New American Library, 1968. Cook, Fred J. The Nightmare Decade: The Life and Times of Senator Joe McCarthy. New York: Random House, 1971. Crosby, Donald F. God, Church, and Flag: Senator Joseph R. McCarthy and the Catholic Church, 1950-1957. Chapel Hill: University of North Carolina Press, 1978. Daynes, John Gary. Making History: Joseph R. McCarthy, Martin Luther King, Jr., and the Place of the Past in American Public Life." Ph.D. dissertation, University of Delaware, 1996. Deaver, Jean Franklin. A Study of Senator Joseph R. McCarthy and McCarthyism as Influences Upon the News Media and the Evolution of Reportorial Method. Ph.D. dissertation, University of Texas at Austin, 1969. De Santis, Vincent P. American Catholics and McCarthyism. Catholic Historical Review 51 (April 1965): 1-30. Dulles, Eleanor Lansing. Footnote to History: A Day in the Life of Senator Joe McCarthy. World Affairs 143 (Fall 1980): 156-62. Evans, Medford. The Assassination of Joe McCarthy. Boston: Western Islands, 1970. Evans, M. Stanton. Blacklisted by History: The Untold Story of Senator Joe McCarthy and his Fight Against Americas Enemies. New York: Crown Forum, 2007. Ewald, William Bragg, Jr. Who Killed Joe McCarthy? New York: Simon & Schuster, 1984. Feuerlicht, Roberta Strauss. Joe McCarthy and McCarthyism: The Hate that Haunts America. New York: McGraw-Hill, 1972. Fried, Richard M. Men Against McCarthy. New York: Columbia University Press, 1976. Goldston, Robert C. The American Nightmare: Senator Joseph R. McCarthy and the Politics of Hate. Indianapolis: Bobbs-Merrill Co., 1973. Grant, Philip A., Jr. Midwestern Senators and the 1954 Censure of Joseph R. McCarthy. Midwest Review, 2d ser. 14 (1992): 63-70. Griffith, Robert. The General and the Senator: Republican Politics and the 1952 Campaign in Wisconsin. Wisconsin Magazine of History 54 (Autumn 1970): 23-29. ___. The Political Context of McCarthyism Review of Politics 33 (January 1971): 24-35. ___. Politics of Fear: Joseph R. McCarthy and the Senate. 1970. 2d ed., with new introduction. Amherst: University of Massachusetts Press, 1987. ___. Ralph Flanders and the Censure of Senator Joseph R. McCarthy. Vermont History 39 (Winter 1971): 5-20. Griffith, Robert, and Athan Theoharis, eds. The Specter: Original Essays on the Cold War and the Origins of McCarthyism. New York: New Viewpoints, 1974. Herman, Arthur. Joseph McCarthy: Reexamining the Life and Legacy of Americas Most Hated Senator. New York: Free Press, 2000. Kendrick, Frank Jenness. McCarthy and the Senate. Ph.D dissertation, University of Chicago, 1962. Kew, D. A. The Decline and Fall of Senator McCarthy. Political Quarterly 37 (October-December 1966): 394-415. Landis, Mark. Joseph McCarthy: The Politics of Chaos. Selinsgrove, PA: Susquehanna University Press, 1987. Latham, Earl, ed. The Meaning of McCarthyism. 1965. 2d. ed. Lexington, MA: D.C. Heath, 1973. Luthin, Reinhard H. Joseph R. McCarthy: Wisconsins Briefcase Demagogue. In American Demagogues: Twentieth Century, pp. 272-301. 1954. Reprint. Gloucester, MA: Peter Smith, 1959. Matusow, Allen J., ed. Joseph R. McCarthy. Englewood Cliffs, NJ: Prentice-Hall, 1970. McCarthy, Joseph R. Americas Retreat from Victory. New York: Devin-Adair, 1951. ___. McCarthyism: The Fight for America. 1952. Reprint. New York: Arno Press, 1977. McDougall, Daniel John. McCarthyism and Academia: Senator Joe McCarthys Political Investigations of Educators, 1950-1954. Ph.D. dissertation, Loyola University of Chicago, 1977. Meyer, Karl Ernest. The Politics of Loyalty, from La Follette to McCarthy in Wisconsin: 1918-1952. Ph.D. dissertation, Princeton University, 1956. OBrien, Michael. The Anti-McCarthy Campaign in Wisconsin, 1951-1952. Wisconsin Magazine of History 56 (Winter 1972-1973): 91-108. ___. McCarthy and McCarthyism in Wisconsin. Columbia: University of Missouri Press, 1980. ___. Robert Fleming, Senator McCarthy and the Myth of the Marine Hero. Journalism Quarterly 50 (Spring 1973): 48-53. ___. Young Joe McCarthy, 1908-1944. Wisconsin Magazine of History 63 (Spring 1980): 179-232. Oshinsky, David M. A Conspiracy So Immense: The World of Joseph McCarthy. New York: Free Press, 1983. ___. 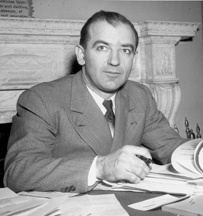 Senator Joseph McCarthy and the American Labor Movement. Columbia: University of Missouri Press, 1976. Polsby, Nelson W. Down Memory Lane with Joe McCarthy. Commentary 75 (February 1983): 55-59. ___. Towards an Explanation of McCarthyism. Political Studies 8 (October 1960): 250-71. Potter, Charles E. Days of Shame. New York: Coward-McCann, 1965. Reeves, Thomas C. The Life and Times of Joe McCarthy: A Biography. New York: Stein & Day, 1982. ___. McCarthyism: Interpretations Since Hofstadter. Wisconsin Magazine of History 60 (Autumn 1976): 42-54. ___. The Search for Joe McCarthy. Wisconsin Magazine of History 60 (Spring 1977): 185-96. ___. Tail Gunner Joe: Joseph R. McCarthy and the Marine Corps. Wisconsin Magazine of History 62 (Summer 1979): 300-313. ___, ed. McCarthyism. Hinsdale, IL: Dryden Press, 1973. Ricks, John Addison, III.  Mr. Integrity and McCarthyism: Robert A. Taft, Sr. and Joseph R. McCarthy. Cincinnati Historical Society Bulletin 37 (Fall 1979): 175-90. ___.  Mr. Integrity and McCarthyism: Senator Robert A. Taft and Senator Joseph R. McCarthy. Ph.D. dissertation, University of North Carolina at Chapel Hill, 1974. Rogin, Michael P. The Intellectuals and McCarthy: The Radical Specter. Cambridge: M.I.T. Press, 1967. Rorty, James, and Moshe Decter. McCarthy and the Communists. 1954. Reprint. Westport, CT: Greenwood Press, 1972. Rovere, Richard H. Senator Joe McCarthy. 1959. Reprint. Berkeley: University of California Press, 1995. Schrecker, Ellen. The Age of McCarthyism: A Brief History with Documents. Boston: Bedford Books of St. Martins Press, 1994. Shannon, David A. Was McCarthy a Political Heir of La Follette? Wisconsin Magazine of History 45 (Autumn 1961): 3-9. Steele, Robert V.P. [Lately Thomas]. When Even Angels Wept: The Senator Joseph McCarthy AffairA Story Without a Hero. New York: William Morrow & Co., 1973. Strout, Lawrence N. Covering McCarthyism: How the Christian Science Monitor Handled Joseph R. McCarthy, 1950-1954. Westport, CT: Greenwood Press, 1999. ____. McCarthyism Revisited: TRBs Story." Journal of American Culture 22 (Summer 1999), 77-84. Thelen, David P., and Esther S. Thelen. Joe Must Go: The Movement to Recall Senator Joseph R. McCarthy. Wisconsin Magazine of History 49 (Spring 1966): 185-209. Theoharis, Athan G. McCarthyism: A Broader Perspective.Maryland Historian 12 (Fall 1981): 1-8. Thornton, Brian. Published Reaction When Murrow Battled McCarthy." Journalism History 29:3 (2003): 133-146. U.S. Congress. Memorial Services Held in the Senate and House of Representatives of the United States, Together with Remarks Presented in Eulogy of Joseph Raymond McCarthy, Late a Senator from Wisconsin. 85th Cong., 1st sess., 1957. Washington: Government Printing Office, 1957. Watkins, Arthur V. Enough Rope: The inside story of the censure of Senator Joe McCarthy by his colleaguesthe controversial hearings that signaled the end of a turbulent career and a fearsome era in American public life. Englewood Cliffs, NJ: Prentice-Hall, 1969. Weintraub, Rebecca. Joseph McCarthy as Leader: An Image Analysis. Ph.D. dissertation, University of Southern California, 1983. Wicker, Tom. Shooting Star: The Brief Arc of Joe McCarthy. Orlando: Harcourt, 2006.